Ever since The Essex Serpent exploded onto the literary scene, Sarah Perry has been considered one of the finest voices in British fiction writing. A Sunday Times bestseller, Book of the Year at the British Book Awards, shortlisted for the Costa Book Awards, and longlisted for the Baileys Women’s Prize for Fiction, The Essex Serpent has been one of the most popular and talked-about novels of recent years. Now, Sarah has followed up on this monumental success with a lyrical, haunting treatise on loneliness, grief, guilt, and love. Drawing on the legend of Melmoth the Wanderer, Sarah transports the reader to the frost-riddled streets of modern Prague in winter. Gently, yet insistently, we are pulled back into the past, through centuries of hauntings and lifetimes of regret and shame, culminating in a contemporary mystery as the secrets of those dogged by Melmoth’s presence are brought to the surface. 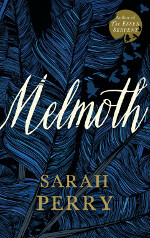 Through Sarah’s trademark sumptuously beautiful prose, the lives touched by Melmoth are laid bare, their weaknesses, strengths, fears, and passions exquisitely sketched. Eerie and soulful, Melmoth is not only a worthy successor to The Essex Serpent, it is a masterclass in fiction writing. In 2016 we were fortunate enough to host Sarah as a rising star of fiction. We are enormously proud to welcome her again as one of Britain’s best-loved contemporary novelists.